The Northeast has a huge unmet need. This trio is getting ready to serve it, and make money along the way. Over the last decade and a half, New England's use of natural gas for electricity has increased from 15% of generation to about 50%. Individual customers have increasingly shifted from oil to gas for home heating along the way, too. Pipelines into the region, meanwhile, have not kept up with changing demand. Spectra Energy (NYSE:SE) and Spectra Energy Partners (NYSE:SEP) are looking to solve this increasingly problematic disconnect. As winter hits the Northeast, it's hard not to think about the so-called polar vortex that caused so many problems last year. One of the most notable for power companies was a huge increase in demand and prices for natural gas, driven by increased electricity use and the greater need for gas as a heating fuel. You can see the price spike this caused in early 2014 in the chart below. 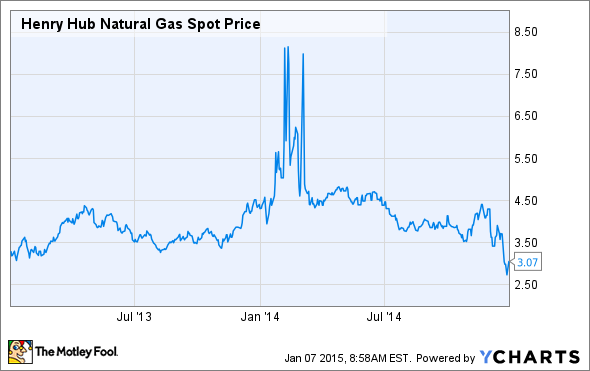 Natural gas went from about $4.50 per million Btu to over $8. That puts a huge financial burden on consumers, who see higher utility rates and increased costs for heating their homes, at a time when they simply have no choice but to pay up. So while natural gas has been good for the Northeast's environmental footprint, it has exposed the region to a troubling reliance on a scarce commodity. But it's only scarce because there aren't enough pipelines to deliver natural gas during peak demand scenarios. In fact, the United States has plenty of gas. The combination of hydraulic fracturing and horizontal drilling have ensured that. And two of the most prolific gas formations, the Marcellus and Utica regions, are literally right next door. The key missing piece is the infrastructure to get the gas from where it is drilled to where it is consumed. That's where Spectra Energy and its "child" Spectra Energy Partners come in. The duo is working with Northeast Utilities (NYSE:ES) to build the $3 billion Access Northeast project. The interesting thing about this project is that it isn't a new pipeline, according to the companies: "The gas pipeline expansion project will enhance the Algonquin and Maritimes pipeline systems, using existing routes to minimize effects on communities, landowners and the environment." That should make it easier to get things done. This is only one of many projects that the Spectra duo have been working on. Between 2013 and 2020, the pair expects to spend $35 billion on infrastructure investments. That should help drive top and bottom line-results, and keep dividends growing. In fact, both Spectra Energy and Spectra Energy Partners recently sported payout yields of about 4.3%. For those looking to avoid the tax complications of a master limited partnership, or MLP, Spectra Energy is the better choice.The pipeline, which isn't scheduled to be in full service until 2018, will provide connections to existing supply hubs and other pipelines, and allow for firm supply commitments. In other words, Spectra and Spectra Energy Partners are guaranteeing that gas will be available when utilities need it, even during an extreme weather event. The project is scalable, so if demand keeps growing, Access Northeast can grow along with it. The sheer size of Spectra's infrastructure investment plans, however, shows there is plenty of room for others in the midstream space, specifically in the Northeast. For example, Kinder Morgan (NYSE:KMI) is also looking to serve the Northeast with new pipelines. The company is working on the Northeast Energy Direct project, which is set to make extensive use of existing infrastructure, is scalable, and has a projected in-service date of 2018. Kinder Morgan, which has just completed a complicated consolidation of its MLPs, yields roughly 4.3% and is the largest infrastructure company in North America. The utility industry shift toward natural gas helps ensure there will be customer demand for projects like these. Moreover, by investing in such infrastructure owners, you avoid the risk of commodity price swings, because Spectra, Spectra Energy Partners, and Kinder Morgan are all toll takers, for the most part being paid for delivering what passes through their systems. If you are looking for a reliable dividend payer with slow and steady growth potential, any one of this trio will fit the bill. Projects like Access Northeast are the backbone of that opportunity -- filling in where a massive unmet need exists.